Since 1992, Chemplex Automotive Group, Inc. (Chemplex) has been making and marketing an extensive range of automotive additives and general service cleaning products presented in tablet and ultra-concentrated liquid form. How is the Dyno-tab® range different from the typical highly diluted bottled products designed for the same purpose? Most bottled products start out with the same active ingredients as Dyno-tab®: powdered or granulated fuel detergents and combustion additives that are then dissolved in a carrier fluid. For fuel products, the carrier might be something like paint thinner or diesel fuel. For coolant and windshield products, the carrier is water. The resultant tablet alternative may weight 3 grams or less and provide all the benefits of a 12 oz. - 1 gal. bottle that contains up to 98% or more carrier fluid. This video explains the differences. Why are there liquid products in the Dyno-tab® line if tablets are so much more effective? Some product simply cannot be processed into tablet form. So for Dyno-tab® Ultra Concentrates, active ingredients are solubilized in the absolute minimum of diluent, packaged in smallest possible bottle and sold in that form. The resultant bottle of 6 oz. super concentrated liquid additives is designed to deliver all the benefits of 12 or 32 oz. bottled products, but be much more cost efficient with less carrier fluid and far lower shipping and distribution costs. What is Dyno-tab® and what are the benefits of using it? How rapidly does a standard one gram Dyno-tab® tablet dissolve? Depending on the aromatic quality of the local gasoline or diesel, Dyno-tab® will completely dissolve in 25 to 40 minutes after being added to the tank as this video illustrates. Is Dyno-tab® safe for use in all gasoline and diesel engines? Dyno-tab® is safe and effective for all gasoline, ‘flex fuels’, ethanol blended gasolines, diesel and bio diesel. The Dyno-tab® chemistry promotes and improves combustion of hydrocarbon fuels. That means that Dyno-tab® produces a more complete burn which results in improved engine efficiency and reduced emissions. How can the same tablet be used in both gasoline/petrol and diesel? The combustion process for any type of hydrocarbon fuel is essentially the same, particularly when involving an internal combustion engine. The Dyno-tab® chemistry improves the combustion of this fuel irrespective of the engine type. That means gasoline or diesel engines get more of a complete combustion which results in more power, less smoke and emission and increased fuel economy. How often should I use Dyno-tab®? For maximum benefit, use the recommended size of Dyno-tab® with each and every fill up. Dyno-tab® improves the fuel, so when the fuel from that fill up is gone, so are most of the benefits of Dyno-tab®. How many tablets should I use per fill up? That depends on the quantity of gallons or litres of the fill up. Dyno-tab® comes in a variety of sizes for many different tank size and fill capacities. In some parts of the world, consumer vehicles routinely hold approximately 30 litres/8 gallons. For them, the Dyno-tab® Compact half gram tablet is preferred. In other markets, where larger vehicles have 60 litre/16 gallon tanks and most fill ups are in that range, the Dyno-tab® one gram tablet is the answer for more power and performance, a reduction in emissions and smoke and better fuel economy. Dyno-tab® comes in many sizes as well as a range of vials of granulated product for heavy-duty trucks, industrial applications and bulk tank treatments. Does regular formula Dyno-tab® increase octane? One of the benefits of regular Dyno-tab® is an increase in octane. One regular one gram tablet in 60 litres/16 gallons of gas will, on average, increase octane by a noticeable 6 to 8 points. The improvements are greater in gasoline that is low in octane. Such low octane gasoline can be found in many markets outside of the U.S. and ‘old’ Europe. Can Dyno-tab® be used in smaller engines such as those found on motorcycles, jet skis, quads, home generators, lawnmowers, snow blowers or other power tools? There are Dyno-tab® packages that are specifically sized for smaller engines. These include motorbike and motorcycles and all manner of recreation toys and small household products like garden equipment and emergency generators. What additional properties does Dyno-tab® ULTRA Fuel Booster have? Many fuels available today are much dryer than prior generations of fuels. For diesel, this might be because the sulfur has been removed, as in Ultra Low Sulfur Diesel fuel (ULSD), or it has been diluted with kerosene or other mineral spirits. This resultant diesel is very dry – without lubrication – and that dryness can cause damage to the fuel injector or the upper cylinder (top end) of the engine. For gasoline/petrol that has been diluted with ethanol, alcohol or MTBE, you have the same problem – gasoline/petrol too dry to support lubrication of the critical surfaces in the upper end of the engine or in older mechanical injectors. In addition to providing upper cylinder lubrication, ULTRA delivers the same powerful benefits found in regular formula Dyno-tab® and Dyno-tab® PLUS – maximum power and performance, improved fuel economy, reduced emissions and always-fresh fuel. How does the Dyno-tab® Plus formula differ from regular formula? The Plus formula of Dyno-tab® products offers several additional benefits, without the loss of any of the basic benefits. Plus products, which are sized and packaged for many diverse applications, keep the fuel delivery system clean and free from power-robbing deposits. This includes injector fouling carbon deposits that distort the fuel injector fog spray pattern. This formulation also retards the formation of gum and varnish on all fuel delivery surfaces. And, YES, the proprietary Plus chemistry will also work to keep older carbureted engines free from deposits. Does Dyno-tab® Plus formula increase octane? YES, the increase in octane is approximately 6 to 8 points, depending on the octane of the gasoline/petrol prior to addition of the tablet. Does the Dyno-tab® Plus tablet pick up and remove water from my fuel tank? Dynotab® Plus effectively picks up and holds water suspended in the fuel until it is burned in the normal engine combustion process. How quickly does a one gram Dynotab® Plus tablet dissolve when added to my gas tank? Dissolving time is anywhere from 25 to 40 minutes after being added to the fuel tank. See more here. What kind of fuel economy improvement might I expect? Use of Dyno-tab® Plus tablets, just like regular formula, improves combustion. Improved combustion results in more power and greater economy. Drivers who continue to drive in the same manner should experience improvement of 4 to 12 percent in fuel economy. After 20 years of selling products that improve combustion, we occasionally hear of users who drive more aggressively when experiencing the additional power and performance provided by Dyno-tab®. Users with such aggressive driving habits will in fact experience poorer fuel economy. My injectors are severely fouled. Will a Dyno-tab® Plus Injector Cleaner tablet unblock that clogging? Probably not. Use of Dyno-tab® on a regular basis will clean and keep clean fuel injectors. However, if there is significant fouling of injectors, you will need a more aggressive clean up by using a full strength, high quality liquid such as Dyno-tab® Fuel System Cleaner (coming soon!) and adding that to your tank when it is less than half full. That concentration of a cleaning cocktail will clean most fuel systems. You may also consider a profession cleaning service performed by your garage or a service professional. I use your tablets in my personal car. Do you have a product for my truck? The Dyno-tab® fuel additive ranges also comes in fast dissolving ‘crumb’ form, which is packaged in assorted vials for ease of treating different on board and bulk storage tanks. You get the same improvements in power and economy with a reduction in smoke and harmful emissions without the mess of bottled additives. On our farm, we have a 500 gallon diesel storage tank for tractors and other implements and equipment. How can we keep that fuel from going bad? We only get it filled once every 6 months, so it does sit around for a long time. Available in a single use vial of 30 grams, the Dyno-tab® Fuel Stabilizer formula for bulk treat will keep the fuel fresh and sludge free. This proprietary Dyno-tab® chemistry will also control water and keep it suspended within the fuel where it will be burned off with the fuel. An added benefit is that the vehicles that fill from this tank will also have the same fresh fuel as well as a corrosion inhibitor that protects all the metal surfaces in the tank and fuel delivery system. I sometimes buy a competitive octane boost in a 12 oz. bottle. 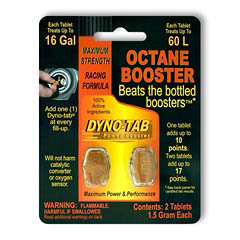 What is the difference between that product and the Dyno-tab® Octane Booster tablets? In terms of net octane increase, Dyno-tab® Octane Booster delivers a greater octane increase than most bottled competitors. And the cost is generally much lower. Bottled products use a similar chemistry of active ingredients that actually does the job of raising octane, however, those ingredients are dissolved in a carrying fluid like diesel or petroleum solvent (paint thinner) and then the cocktail is bottled. Dyno-tab® compresses those same ingredients into a tablet which dissolves quickly and completely when added to fuel. How does Dyno-tab® Octane Booster differ from regular formula? While the regular Dyno-tab® fuel tablet does increase octane, Dyno-tab® Octane Booster has more of that proprietary ingredient and increases octane more than regular formula Dyno-tab®. How much of an octane increase will each 1.5 gram tablet deliver? My car is ten years old and seems to NEED higher octane. Why? As it ages, your engine REQUIRES greater octane in order to perform at the SAME level as it did when NEW. That phenomenon is called Octane Requirement Index (ORI) and happens to all engines as they age. There are many reasons -- wear and erosion of fine engine tolerances, deposits within the combustion chamber and in the fuel delivery system are the two most pronounced. When this happens, higher octane gasoline is required to get the same engine performance as you had when the vehicle was new. They offer 92 and 96 octane gasoline in Europe. Why is octane so much higher there than in the U.S.? The octane sold at retail is the same in Europe as in the United States. They do, however, calculate and post the number differently. Gasoline octane in the U.S. and other North American markets post the average of the two test protocols used for testing octane. The average between the Motor Octane Number (MON) and the Research Octane Number (RON) is the number posted on the pump. This compares to Europe and many Asian and African markets where the RON measurement is the same number posted on the pump. So, while there appears to be an actual difference in octane, there is, in fact, only a different protocol to figure the number. 91 Octane in the U.S. is probably identical to 96 octane in Germany, for example. 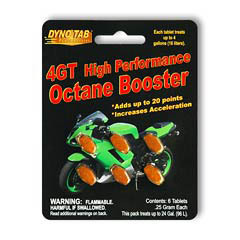 The Dyno-tab® Octane Booster package claims to increase octane by two NUMBERS? A competitive bottle octane boost claims to increase octane 6 points. Which is better? Each 10 “points” of octane add up to one “number”. So, if a bottled octane booster claims to add 6 points, addition of that additive to 91 octane gas will result in 91.6 octane. However, if two Dyno-tab® Octane Booster tablets are added to 91 octane gasoline, the resultant 2 “numbers” will bump it to 93 octane! Correct octane is one of many elements that lend it to getting all the performance, economy and power from you engine. But increased octane is what the performance buffs and people in the know want. They know that higher octane means faster, smoother acceleration and pick up. And, many cars specify high octane fuel requirements in their owner’s manual. Most modern engines that utilize high compression ratios and fuel injection require reasonably high octane to even get those engines running. I have a 1964 Oldsmobile 442. With regular gasoline, the car seems to run very poorly. Why? Most of the classic ‘muscle’ cars required high octane gasoline. Those engines were designed for full leaded “Ethyl” or “High Test”. Today’s gasoline is a far cry from what those muscle car owners could buy at the pump. Use of Dyno-tab® Octane Booster goes a long way in recreating that power and performance from many of those vintage engines. I have an older Harley that is designed for leaded gasoline and, absent that, requires a “lead substitute”. Do I break a piece off a one gram tablet and use that and does it supply the protection of lead? Dyno-tab fuel treatments act as a "lead substitute". For U.S. sized motorcycles, Dyno-tab® offers a specially sized tablet called the Dyno-tab® 4GT High Performance Octane Booster. The 4GT offers a flexible treat rate where riders can dial the octane they want from 7 points up to 20 points. The Dyno-tab® range also offers ‘motorbike’ tablets (Dyno-tab® 8L pouch) for those 70 to 150cc bikes and scooters popular in overseas markets with smaller onboard tank capacity. BEATS THE BOTTLED BOOSTER! Is that just marketing talk or is there real test data to support Dyno-tab® tablets outperforming the bottled octane boosters? Chemplex has conducted extensive octane tests at a well-known, accredited laboratory comparing its tablet chemistry to most major and many minor competitors in the octane booster category. The Octane Booster Comparison Test results speak for themselves. 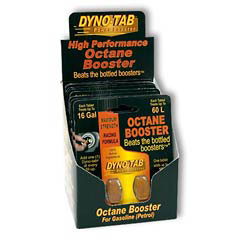 Dyno-tab® truly does beat the bottled competitor is the octane booster category! Why do you need to add STABILIZER to the fuel tank when that gasoline or diesel won’t be used for an extended period?? Any of today’s fuels – unleaded gasoline, the oxygenated gasoline blends, diesel fuel and heating or fuel oil – begins to deteriorate after as little as 30 days. Oxidation and agglomeration of the fuel produce all kinds of bad things like sludge and gum. These are much harder to burn in the internal combustion process and cause hard starting, rough idling and smoke. Dyno-tab® Fuel Stabilizer retards that aging process. What does a fuel STABILIZER do exactly? Multi-functional fuel stabilizers like Dyno-tab® provide rust and corrosion protection for all metal surfaces in the fuel delivery system, plus the addition of Dyno-tab® Fuel Stabilizer will prevent hydrocarbon fuels from oxidizing and agglomerating, two prime causes of bad fuel. Lastly, Dyno-tab® Fuel Stabilizer formula contains a component that ensures and promotes fast, trouble-free start when you once again want to use that engine. In addition, the fuel that has been stored will burn with little or no smoke. How long will using Dyno-tab® Fuel Stabilizer keep my gasoline fresh? Under normal conditions your fuel should stay free of gum, varnish and sludge for one year. For longer storage periods, double the recommended dose and you should get a fast, smooth start when you re-fire the engine. How rapidly does the Dyno-tab® Fuel Stabilizer dissolve after being dropped in fuel? That depends. One tablet treats and protects up to 2.5 gallons and in gasoline will fully dissolve 6 to 10 minutes. In diesel fuel it will take slightly longer and up to one hour in fuel oil. The latter two fuels are much less aromatic in chemistry so the dissolving process takes longer. What are the uses for Dyno-tab® Fuel Stabilizer tablets? Dyno-tab® specializes in tabletizing product you might routinely find in bottled/liquid. A fuel stabilizer is recommended whenever you store an engine and have not drained the fuel. This might include seasonal items like lawnmowers, snow blowers, power washers, chain saws and farm & industrial equipment. Seasonal toys also require their fuel to be protected – jet-skis, quads, snowmobiles and vintage or antique vehicles. How do I best use the Dyno-tab® Windshield Washer Tablets? Dyno-tab® Windshield Washer Tablets offer the best option to keeping your windshield sparking clean while being a good environmental citizen. Just add one Dyno-tab® Windshield Washer Tablet directly to your window washer reservoir. Each fast-dissolving tablet creates one full gallon (3.79L) of powerful cleaning fluid that is non-toxic, biodegradable and safe for all vehicle finishes. Special Note: To optimize cleaning, replace regular tap water with one gallon of deionized or distilled water. Check out this video for more tips and info. What are the advantages to using a tablet? Dyno-tab® Windshield Washer Tablets provide superior cleaning without the use of dangerous and often poisonous chemicals. Dyno-tab® is composed of food grade components that will NOT harm the environment, washer pump, spray nozzles or wiper blades. And, like all Dyno-tab® tablets in our automotive range, there is NO BOTTLE – NO SPILLS – NO MEASURING – NO MESS! How fast does a Dyno-tab® WWT dissolve? 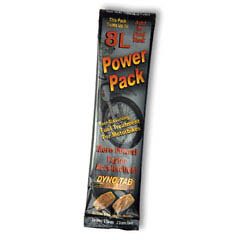 Dyno-tab® WWT completely dissolves and mixes with reservoir fill in less than 20 minutes. There is no dissolved debris or insoluble particles that might clog the sprayer nozzles and the resultant cleaning fluid is effective immediately. A leading competitor takes as long as two hours to dissolve. Is the Dyno-tab® WWT / water solution proven safe for car finishes, including the newest clear coats? Dyno-tab® Windshield Washer Tablets are laboratory tested and proven safe. In addition to being safe, use of Dyno-tab® Windshield Washer Tablets provide additional benefits: - Cleans hard water deposits in the washer spray nozzle that block or alter the spray pattern. - Cleans water spots with continued use. What about winter (freezing) temperatures? Dyno-tab® Windshield Washer Tablets can be safely added to solvent type windshield antifreeze to improve cleaning function. Most cold weather solvents are 10 to 20% methanol and while they will protect against the reservoir freeze and can be used to melt windshield ice, that fluid is a poor cleaner. Adding Dyno-tab® Windshield Washer Tablets will improve fluid cleaning capability to remove dirt, salt and other common winter windshield problems. What is wiper ‘CHATTER’ and how does the Dyno-tab® Windshield Washer Tablets fight it? When wipers stick, skip and hop across the windshield, not only does this annoying ‘chatter’ result in poor cleaning, but also shortens wiper blade life. For best cleaning, the wiper blade should glide quietly and snugly against the surface of the glass. Proprietary wetting agents in Dyno-tab® Windshield Washer Tablets reduce the surface tension on the glass surface so the blade glides over the surface with less resistance. Additionally, these wetting agents keep wiper blades softer and more pliable resulting in extended life. How does Dyno-tab® Cooler Coolant® extend the service life of my existing coolant? Automotive coolant fill is made up of 50% deionized water, 47% ethylene glycol and 3% additive package. The additive package consists of a rust/corrosion inhibitor, a water pump lubricant and an anti-foam agent. It is this package of additives that will wear out over time and, most often, that is when the service technician will tell you it's time to change your coolant. However, you can instead re-energize and extend that coolant simply by adding back the additive package that is worn out. Dyno-tab® Cooler Coolant™ is that package. How do you add Dyno-tab® Cooler Coolant® to the coolant? It's simple. Add the required number of fast dissolving tablets to the radiator by safely removing the radiator cap when the engine is off and cool. Each package treats / restores a 12-litre cooling system. No need to drain the system. NOTE: Do not add tablets to the overflow tank. This is not an effective way to get the Dyno-tab® Cooler Coolant® chemistry fully distributed within the cooling system. How does an efficient cooling system relate to 'engine overheating'? One of the key additives that is required in coolant is a powerful anti-foam package. Foam is deadly to a cooling system. Often used as insulation, foam traps heat rather than allowing the coolant to flow over the metal surfaces and remove/scavenge heat. Dyno-tab® Cooler Coolant® also reduces the friction between the water and the engine metal surface so coolant flows faster and more efficiently removing engine heat. Dyno-tab® Cooler Coolant® goes to work immediately to restore cooling efficiency and prevent engine overheating. Will Cooler Coolant® work in the new extended life coolant? Yes. The proprietary chemistry of Dyno-tab® Cooler Coolant® is compatible with traditional GREEN and extended life RED or ORANGE coolants. What about 'water only' systems? Dyno-tab® Cooler Coolant® works to provide rust and corrosion protection for those vehicles or stationary cooling systems that are using water only. Cooling efficiency will improve with the control of foam and addition of wetting agents and water pump lubricants. How do I know when my coolant needs to be re-energized? If you have not changed your coolant in the last three years, or if you have and repaired a minor radiator leak and topped off with water, then you need to add Dyno-tab® Cooler Coolant® to ensure that your engine is properly cooled and running at manufacturer's specified operating temperature. For a complete WHITE PAPER prepared on Dyno-tab® Cooler Coolant® see Document 1212. How does the Flush product clean the radiator? This proprietary pH balanced formula cuts system-choking deposits to restore cooling efficiency and fight overheating. Do I have to drain my coolant prior to cleaning the radiator? No. Dyno-tab® Flush cleans while you drive. You can add Flush to your radiator regardless of what is in the system: water only, or any type of old, depreciated coolant. I know coolant loss will lead to overheating, but how does a dirty radiator cause this? Over time, radiator deposits gradually accumulate on metal and plastic surfaces inside the cooling system and form a heat-trapping barrier that retards the heat transfer ability of the cooling system fluid. Performing a radiator flush should be part of your regular vehicle maintenance to prevent overheating and roadside breakdowns. Instructions say I can add Dyno-tab® Stop Leak to my radiator before I have a leak. How can that be? Dyno-tab® Stop Leak is 'free flowing' stop leak agent. Much like the platelets in your blood, this proprietary, fast-dissolving chemistry can be added to the radiator where it freely flows within the coolant. When a leak occurs, the stop leak agents attack the leak and build a network of overlapping micro strands to stop coolant loss. Is Dyno-tab® Stop Leak compatible with all systems and coolant types? Yes. Dyno-tab® Stop Leak tablets can be added to any automotive cooling system no matter what coolant is in that system. That includes the traditional GREEN coolant, RED coolant, any of the variously colored "lifetime" or OEM coolants and a system using 100% water. REMEMBER: No Bottle! No Spills! No Measuring! No Mess!